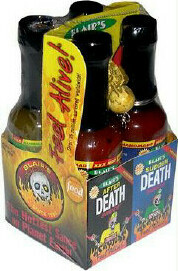 A Four bottle set including Death Sauce, After Death Sauce, Jalapeno Death Sauce and Sudden Death Sauce in smaller bottles, all packaged together in a custom graphic carrying holder! Each bottle is 2 oz instead of the 5 oz typical regular size hot sauce. These are great for picnics, morbid get togethers and for spicing up your airplane cocktail.